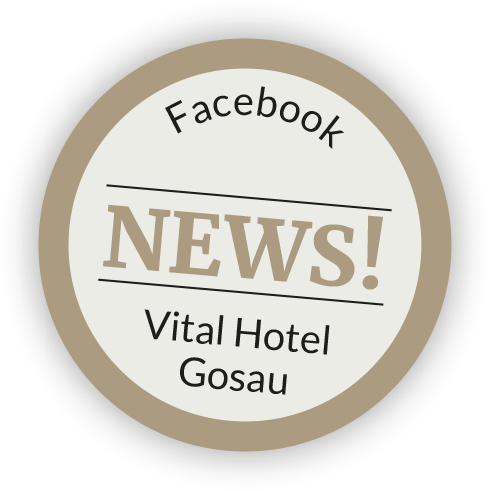 Vitalhotel Gosau is situated in the lovely mountain village of Gosau. The village is in a tranquil and idyllic setting in the natural paradise of the Salzkammergut region, yet it is still easy to get to the centre of Austria. Gosau is also part of the Dachstein region, with largest ski area in Upper Austria – the Dachstein West ski region. And last but by no means least, Vitalhotel Gosau is located on the outskirts of the UNESCO world heritage region - "Hallstatt – Dachstein – Salzkammergut". See for yourself – those of you who enjoy sports and activities, as well as nature lovers, will feel just great here with us. The loveliest excursion destinations in the region are just a stone's throw away. And better still – there are countless opportunities to enjoy activities right on the hotel doorstep. Whether spring, summer, autumn or winter – the natural surroundings in the Salzkammergut region guarantee choice moments of happiness, whatever the season. Could you imagine any better place to enjoy a relaxing holiday? Gosau in the summer: lush meadows, shady woodlands, sunny alpine pastures and mountain peaks which have legendary views. The many walking and hiking, road bike and mountain bike routes traverse the most wonderful natural areas in the Salzkammergut. It's great that one of these bike paths goes right past Vitalhotel Gosau. Hire a bike or an E-Bike at hotel reception – the get pedalling! 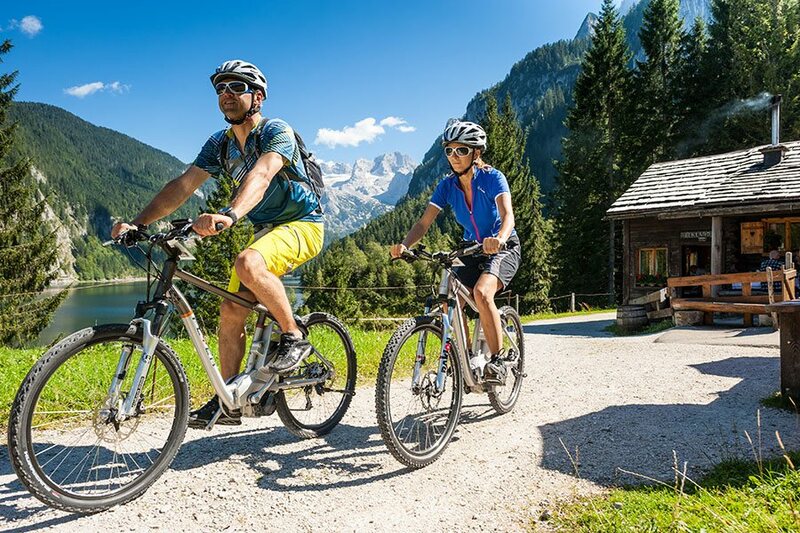 Head out on a leisurely ride in the lush surroundings, or scale the Dachstein mountains on a mountain bike. Vitalhotel Gosau is also an ideal starting point for hikes. Explore the natural gem of Löckermoos on foot, or head out on a family hike to the prehistoric forest. Or what about an alpine tour in the mountains of the Dachstein region? Those of you who prefer to take things a little easier could hop on the excursion train, which stops outside the hotel. The Gosaukammbahn also takes you up to the top. The panoramic views from the Zwieselalm are breath-taking. 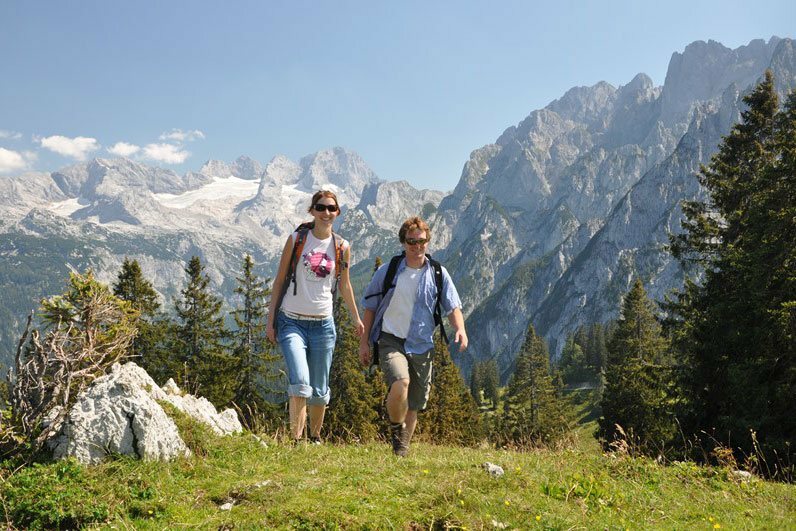 The Dachstein mountains and the Gosaukamm Ridge are a genuine pleasure park for adventurers. In the via ferrata routes and the high ropes areas adrenaline junkies really get to let off steam. While those of you who are looking for a bit of relaxation will also find somewhere to suit your needs in the Salzkammergut. For instance at Lake Gosau, with its famous views to the Dachstein. Gosau offers this and so much more in the summer. Winter sports fans are in luck. Vitalhotel Gosau is situated in the middle of an Alpine winter paradise. Even looking out of the window of your hotel room, the snow-covered Dachstein gives you an idea of the joy that winter in the Salzkammergut has to offer. Your cross-country skiing fun starts right outside the hotel, on the hotel's own cross-country slopes. On 50 kilometres of slopes you get to explore the snow-covered landscape at the foot of the Dachstein and see it at its very best. And the nearest ski lift is also not far away. The free ski bus takes you there, collecting you right outside the hotel. You are now in the largest ski area in Upper Austria - the Dachstein West ski region. 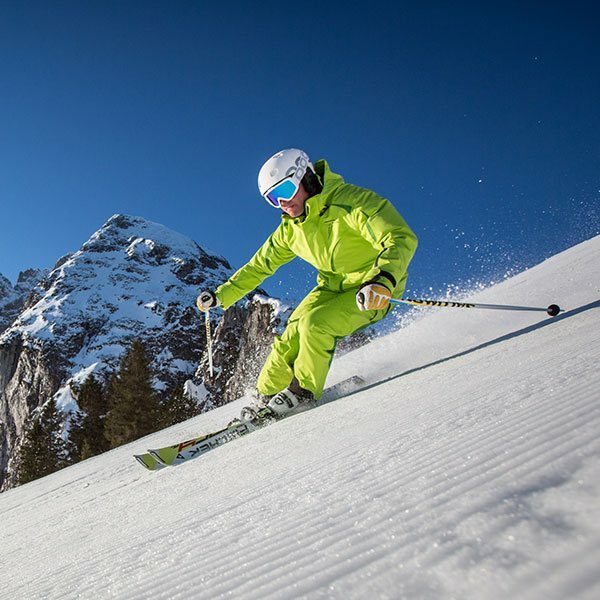 Whether you are a beginner or a professional, skier or snowboarder – on 140 perfectly prepared kilometres of pistes everyone can do what they enjoy best. That is what a variety-packed skiing holiday is all about. During a stop-off for a well-earned break from the pistes you can take a box-office seat in one of the many ski lodges. Replenish your energy stores with some delicious regional food and let the winter sun shine on your face. Pleasure cubed! In the winter wonderland around Gosau action fans and connoisseurs alike are well catered for. Choose from a horse-drawn carriage ride, a torch-lit hike, sledding or tobogganing. All this features in your winter holiday in the Dachstein region.